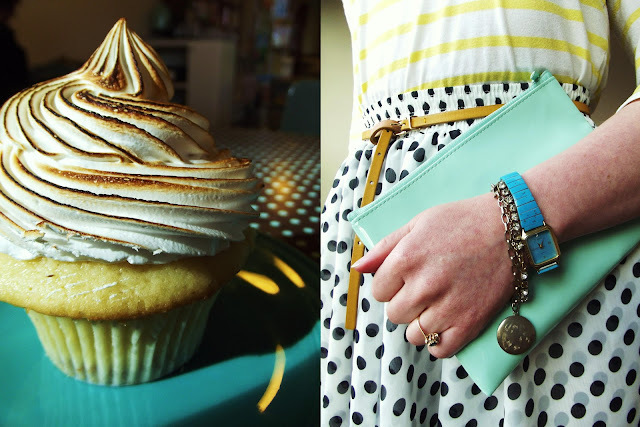 This look was inspired by Trophy Cupcake's flavor of the month: Lemon Meringue. It's pretty amazing. I've already had two and we're not even half way through April! How can you resist a cupcake filled with lemon curd?? My dear readers, you are looking at the last polka-dotted item I will ever acquire. I know I've said this before, but this time I really am at polka dot capacity. If it was acceptable, I would buy polka dot everything forever, but that would just be crazy. Instead I am satisfied with this one last skirt. Actually, I am more than satisfied. I am excited to own it and thrilled that I didn't have to pay a penny for it! It's from American Apparel, but I won it from the lovely Folake at Style Pantry. By chance, I was on Twitter when she announced a special "Tweet back" giveaway, and, by chance, it was my name drawn! It arrived in the mail just in time for lunch with my new blogging friends from Seattle Style Bloggers. love it! love the combination! i`m mad for polka dots, i don`t think i will ever have enough! I so love the colors in this post! the outfit is adorable, and anything with sugar and lemon in it(!!!) - i die. plus, it looks so spring-summer-timey, and i just can't wait to have bare legs! Lemon and mint is such a pretty combination! Could any giveaway be more perfect for you? Polka dot and AA?? Lucky duck! You look adorable, my dear! I loved that skirt on you when we met up and I love it here, too. It's great with the striped top and the yellow accents. I think I might be obsessed with those yellow shoes, too! Love the color and pattern choice. Your so adorable. I've loved your blog for awhile now. Your choice was amazing!!! Chic and Hyped of course!!! I'm Flavia - blogger from Brazil! Nice to meet you honey!! I hope that you enjoy my blog when you can visit me. absolutley stunning outfit, inspired by the cutest cupcake!!!! Love your blog, you are very beautiful and stylish! This made me smile so much...I have that shirt in like a billion colors. And why wouldn't you buy polka dots, huh? They're perfect! Love the cheery mix of prints! You look great in yellow! I love your outfit, but your hair I adore!!! You are cuter than a cupcake! Great ensemble, chica. Stripes and dots! My eternal love :) So very pretty!